Guardian investigative journalist Nick Davies has said that News Corp was considering closing the News of the World months before he revealed that the paper listened to the voicemail messages of missing schoolgirl Milly Dowler. Davies also denied that it was this story, and the now disputed "false hope" claim, caused the Leveson Inquiry. He said any suggestion that his Guardian story, which suggested NoW journalists had deleted messages from Dowler's phone giving her family "false hope" she was alive, had made such an impact was "silly". The story was published on 4 July 2011 and less than a week later the NoW was closed. Four months later The Guardian retracted the false-hope claim after new evidence that suggested the messages may have been deleted automatically. Davies told Press Gazette it is "significant" that at the time of publication he was certain it was true. He was speaking at the London School of Economics' Polis Trust conference where he was quizzed by Financial Times journalist Ben Fenton. Davies said that the dispute over his reporting of the false-hope moment "exposed us to attack for the first time in the two-year period we'd been writing about [phone-hacking] – so of course we got a good kicking". "And of course a kicking from that end of Fleet Street does involve a degree of distortion and exaggeration," he said. "So, for example, people really did try to argue that if it hadn't been for that one angle in that one story the Leveson Inquiry wouldn't have been set up and the NoW wouldn't have been closed." He insisted this was not true, saying News Corporation had been considering closing the paper for "several months" to aid its planned BSkyB bid. "There were several people within there… who were actively pushing to close the paper months before the story was published," Davies said. He pointed out that the Operation Weeting phone-hacking inquiry had been set up in January and Operation Elveden (into bribes) in June – before his story was published. He said: "News International had thrown in their hand [with] all those people like Sienna Miller who was suing in April – they put their hands up and said, 'okay, okay, we did it'. So the pressure was enormous." He also pointed out that other papers, such as The Daily Telegraph, had written "extraordinarily powerful" stories the day after The Guardian's initial report of the Milly Dowler hacking. He told Press Gazette: "The other factor apart of this is the BSkyB bid. So that was launched in June 2010 and during that period of time the primary objective of News Corp strategy was to save that bid. And I think above all that is what made them think about closing the News of the World. "It's really Jan 2011 when the Sienna Miller material came out that the two things connected. 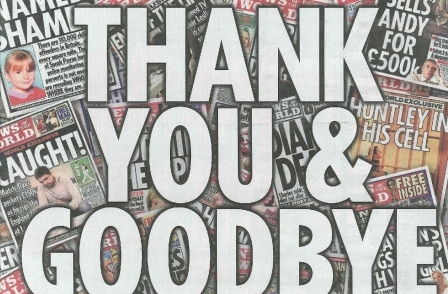 The phone-hacking scandal started to impede that bid."